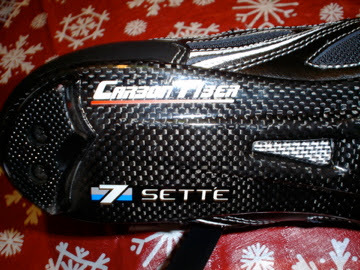 Those are some natty-looking spats, my friend….carbon fiber is just so freakin’ cool! 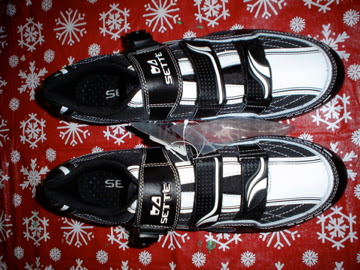 Great deal, too — shoes with carbon soles and buckles like that are usually in the $200 range. Man those shoes look trick! I run Settes(non-carbon) for mountain and road. Can’t beat the value. Where else are you going to get a carbon shoe for $89!? I have wondering about Sette products, some have looked pretty good, the only thing stopping me is the deals (almost EP) I get at my LBS. but I am getting more convinced about Sette. 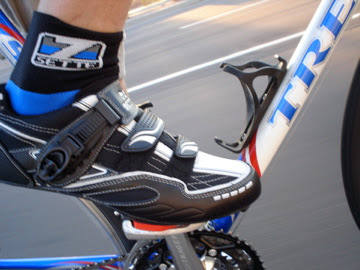 I can’t imagine trying to deal with those slick carbon soles on my stop and go commute. Nor walking into my carpeted office. Seems like a recipe for slip and fall. Mike, you’ll be happy to know that there is a rubber padded heel and toe piece that elevates the sole so the carbon is never really on the ground. Something I didn’t notice until wearing them, but will certainly cover in a more detailed review of the shoe. how are they in terms of sizing? some shoes, like adidas, I’m a 13 when I’m usually a 12 in other brands. I’m looking at getting Euro size 44. I got the Sette Ximo but they were too narrow for my wide feet. What’s the width of the sole for the Elite shoes for size 44?